BIG Show + New Song Premier Nov 14! This Friday, November 14, join us for a night of foot stompin' folk as we return to Kung Fu Necktie in Fishtown! We are calling it the TGIFolk (get it?) show and are excited to be sharing the stage with old friends, New Sweden, from Wilmington, DE and new friends, The Pinkerton Raid, from Durham, NC! Keep your ears open during our set for a bunch of new songs, AND a brand-new-never-heard-by-anyone-else-in-the-whole-world song! The last time we played at Kung Fu Necktie was March 1, 2013, the unforgettable sold-out release show for our album Red Summer Spirit. We were blown away by the support we received from you all that night, so are tapping into those memories and giving you a stompin' kick off to your weekend! Beta Hi-fi Competition - Tomorrow night! We snagged a last minute spot in this year's Beta Hi-fi Emerging Music Festival competition at Wilmington's World Cafe Live at the Queen! We need your support this Tuesday to help us advance to Friday's finals! Tuesday, August 26 World Cafe Live at the Queen (upstairs) 500 N Market Street, Wilmington, DE 19801 BHM on @ 10pm FREE! All Ages! Audience response and attendance count, so we are asking you to come on out! We know it's last minute, but it would mean a lot to us if we could see your faces and hear your voices! If we win on Tuesday, we'll be back on Friday for the finals. We'll be sure to keep you posted. Wilmington beta hi-fi website Since its opening in 2011, World Cafe Live at the Queen in Delaware has continued the beta hi fi tradition started in Philadelphia eight years ago. The free week-long music festival held this year from August 25 - 29 features some of the region’s cream of the musical crop and provides a platform for the Wilmington area’s best emerging musicians and songwriters to be heard by local radio DJs like Mark Rogers, music bloggers like WXPN’s John Vettese, publications like Out and About Magazine, show promoters like Gable Music Ventures, label reps like Jade Tree’s Darren Walters and fans alike. Each year, 20 bands are selected from a batch of over 200 submissions and offered the opportunity to stand out among the rest by performing engaging original songs. A winning band is selected each night based on various judging criteria including showmanship, stage presence, professionalism, creativity, audience appeal, and ability to draw a crowd. These winners then progress to the finals held on August 29th to prove who’s got what it takes to win some tasty prize packages from Disc Makers, Rainbow Books and Music, the Dewey Beach Music Conference and way more. The Queen’s past beta hi fi winners include Lititz, PA’s The Districts, who have since gone on to grab loads of attention nationwide and get themselves signed to record label Fat Possum and Paradigm booking agency; they will be performing on WXPN’s Xponential Music Festival’s main stage this summer. It's almost here! We are nearly coming out of our skins with excitement about playing the 53rd Annual Philadelphia Folk Festival! WXPN's The Key named us one of 6 local artists not to miss at this year's Fest! Lobby Stage - 4:45pm This is our MAIN SET at the Folk Fest. 30 minutes. All killer, no filler. Don't be late. Our set is part of the Philadelphia Music Co-op Showcase from 2pm-6pm. 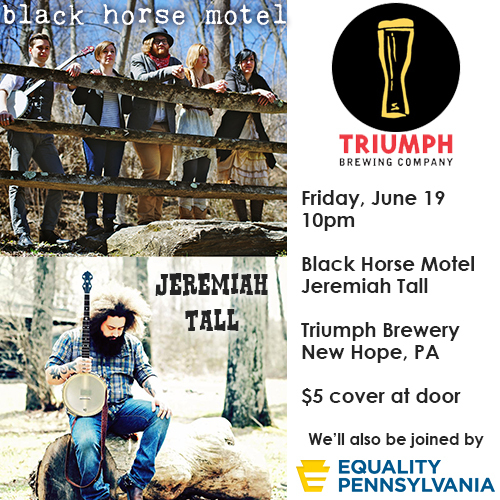 Six great Philly-local bands. See you there! Merch Tent - 6pm-6:20pm Meet & Greet! Come say hello! Also, if you got one of the "golden ticket" stickers Ryann will be handing out, bring it here AT THIS TIME to redeem your prize. All of our musical endeavors are happening on Friday, but most of the band will be at the festival for the weekend. Come find us and we'll trade stories and share a beer! 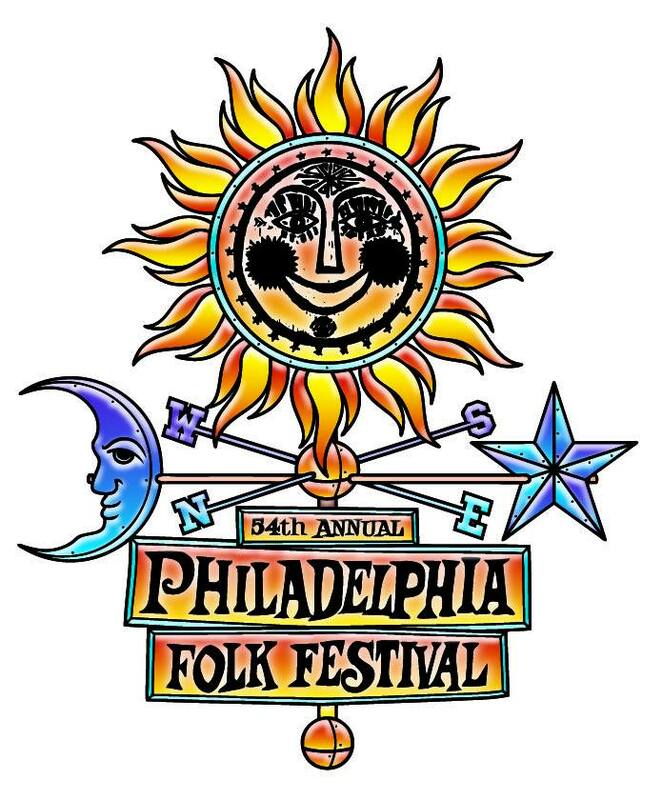 We are VERY excited to announce that we will be playing this year's 53rd Annual Philadelphia Folk Festival! First, big thanks to everyone who came out to our Folk Fest showcase at North Star Bar in April and thanks to the Philadelphia Music Co-Op for choosing us! 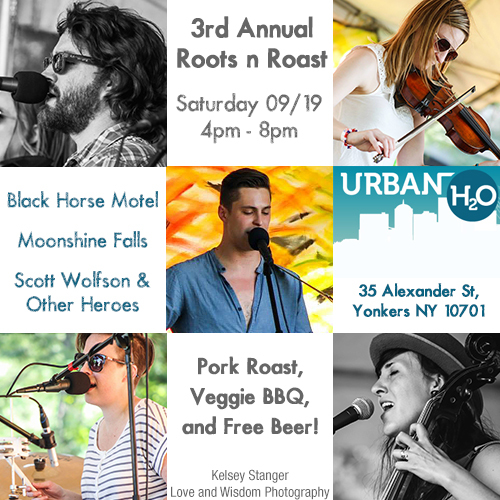 Friday 8/15 - Lobby Stage - Black Horse Motel between 2pm & 6pm. Our set time is TBD. Please check back for updates. For more info on the Philadelphia Folk Festival, go to www.pfs.org. Sunday night saw Black Horse Motel playing at the North Star Bar. It was a shorter set than we're used to playing so we had to trim down the list a bit, and looking at the other bands on the lineup we went with the loudest, foot stompiest, sing-alongiest songs we had. And here's the thing. The audience was AMAZING. Seriously though, the stage was shaking from audience participation. I wanted to personally invite every member of that audience to every show from now on, and I did. Also, let's get some birthday love on. Sunday night was dear fan and friend and overall supporter of Black Horse Motel, Jordyn's, birthday. And for those of you not intimately familiar with our facebook page, Tuesday was Cello and Vocal Extroirdenaire, Desiree's, birthday. Hey Folks, want to treat your dads to something really special this Father's Day? Well guess what! Scientific studies have proven time and time again that nothing calms, soothes, and gets your dad feeling all nostalgic like Black Horse Motel live. If you don't believe the science, just check out this groundbreaking recent video research of fathers listening to Black Horse Motel. Remember to bring your cameras and phones, because you can still win prizes by capturing us live and posting and tagging us! Let's talk travel arrangements. Black Horse Motel is not a tiny outfit. Granted, we're certainly no Polyphonic Spree, but 5 members can equate to an unusual amount of gear. Especially when you start to consider what instruments we play. We've got Megan, rocking a full drum kit. This isn't some paired down jazz kit, and it's certainly no marching snare. This is a rock band stage kit. It takes up some serious space. Desiree plays a cello. For those who don't know, it's like a violin, only enormous. (The upright bass is like a viola only enormous, thank heavens we don't have one of those... yet.) Now Ryann is at least nice enough to keep her kit small. A fiddle we can fit around other instruments in the cars. (Cars, plural, we'll get back to that.) Dave, banjo, that's not bad. Oh right, plus a guitar, plus a mandolin. Now myself, I try to keep things small and compact, you know looking out for the band, just an electric guitar, and acoustic guitar, a pedal board, maybe a square-neck resonator once I get the pickup installed, maybe the round-neck resonator for finger picking... You know, small footprint. Then of course there's the real space takers. I am of course talking about the melodica and the bells. If we throw in a harmonica, a fife, a penny whistle, a slide whistle or a kazoo, we're never going to get everything in there. Right, the cars. You may have seen movies where bands travel around in a piece of specialized band equipment called a "van." Here at the Black Horse Motel stables we like to define "van" as any group of cars whose owners are foolhardy enough to allow us to use them to transport equipment. It's a good working definition and we really love our "van." Also, I don't know if you've ever had an intimate relationship with a cello, but the person in the backseat of our van certainly has. All I have to say is Desiree is one lucky lady to get so much time with that most sensitive and yet fun-loving instrument, the cello. Aw shucks, now my guitars are getting all jealous. Do you like prizes? I sure as hell do. I mean, who doesn't like prizes, right?Well, Black Horse Motel is currently holding a live photo competition..and we're giving away prizes! Now, of course, to win you have to come to our shows...but we know you're coming anyway, so just make sure you don't forget take snap some pics, post, and tag! Our next show is this Friday! Friday, May 9 Hard Rock Cafe Philly 8pm, $10, 18+ buy tickets here! "What kind of prizes can I win? ", you ask? So, for a chance to win, come out to the show on Friday at Hard Rock Cafe. And remember to tag us in the photo/video, or else we'll never know you are an artistic genius. New songs! Boot & Saddle March 7! ♞ Our first time playing the awesome, revamped Boot & Saddle of legend! ♞ Our old friends (and swell folks), Song Dogs! ♞ NEW BLACK HORSE MOTEL SONGS, Y'ALL! Did you say new songs? Yes, I did, IN ALL CAPS! If you missed the last few shows, then you haven't heard one of our new songs, and first written by Galen for the group, "Run, Rabbit, Run", which I've just decided I will now call "R3" because that just looks awesome. Anyway, don't spiral into a depression about R3 because all you have to do is come to the Boot & Saddle on March 7 and we will play it just for you! Amazing! BUT WAIT, there's more...order now and we will double your offer by playing an EVEN NEWER song at the show! Come be the first to hear the new jamzz! In other news - Black Horse Motel is eligible for nomination in 93.7 WSTW's Hometown Hereos Homey Awards. The Homey Awards recognize local Delaware Valley musicians. 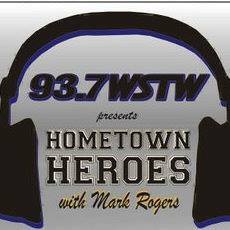 Please see their Facebook post or check out the Hometown Heroes site and follow the directions to nominate us in several categories, including Album of the Year!